I can’t believe second grade is upon us, but here we are! 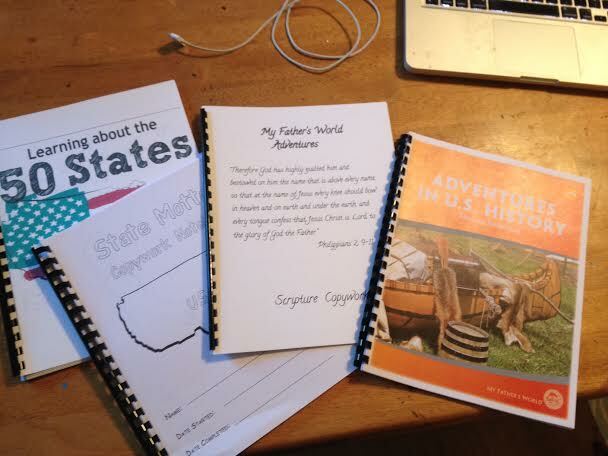 After a lovely “Summer in Spring” break, we are ready to start My Father’s World Adventures. For all you MFW Mamas out there—here is a breakdown of how we “organized” our year, what extras we tossed in and what we took out. 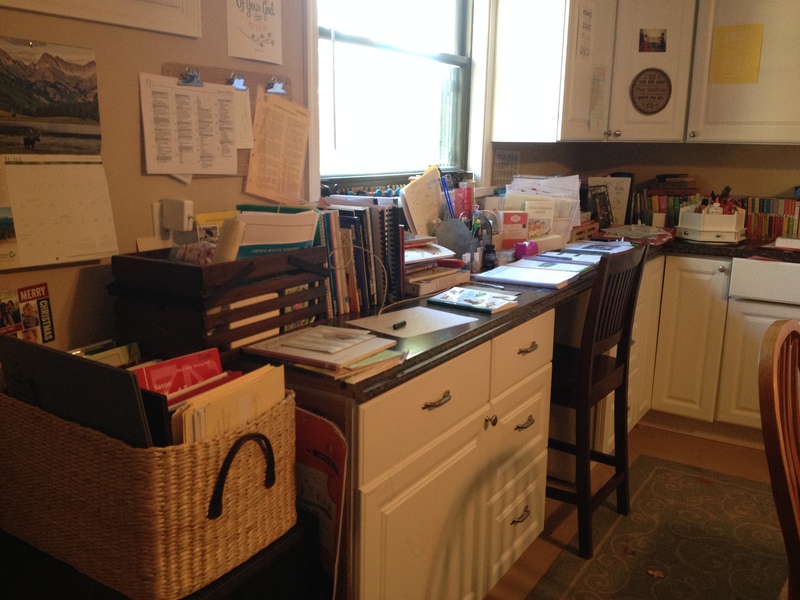 I know lots of über-organized Moms like to label, laminate and make special work boxes for each subject, etc. God bless you, wonderful organized women! I am not gifted that way. If I tried to buy one of those rolling rainbow carts I keep seeing on the Facebook page for Adventures, it would end up hijacked by toddlers driven wild by malicious intent to destroy shiny newly discovered object. The once lovely homeschool cart would end up a fully weaponized derby cart for chickens before the week was out. So yeah, this post won’t feature work boxes of doom. Don’t everybody pin it all at once. The MFW manual has planned out the curriculum by week. 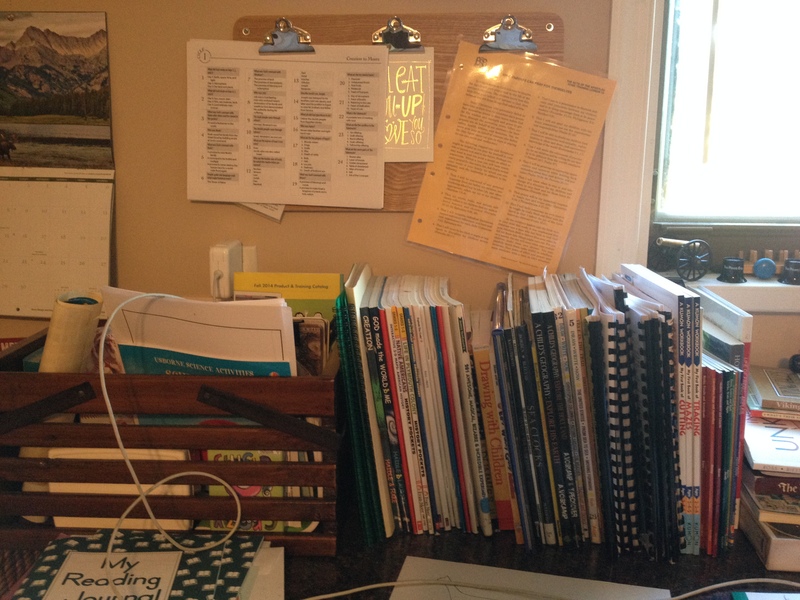 I have found that the homeschool planner term “week” is equivalent to a thumbtack-encrusted anvil about my neck. Weeks 1-4 will be fairly smooth, but you know by the time 5 hits someone will be throwing up on Tuesday and on Thursday you will need to make a meal for your super pregnant friend who is on home lockdown with her 9 kids. You’ll have to mash tons of lessons in on Friday and miss your nature walk, all for the sake of getting that crisp week long unit in. So I ignored the word “week” and subbed in “unit” or “theme.” The lid is off the pressure cooker AND if we are having a great time on a certain topic we can stretch it out a bit without feeling like we are behind. Each unit has its own high-tech manilla folder. 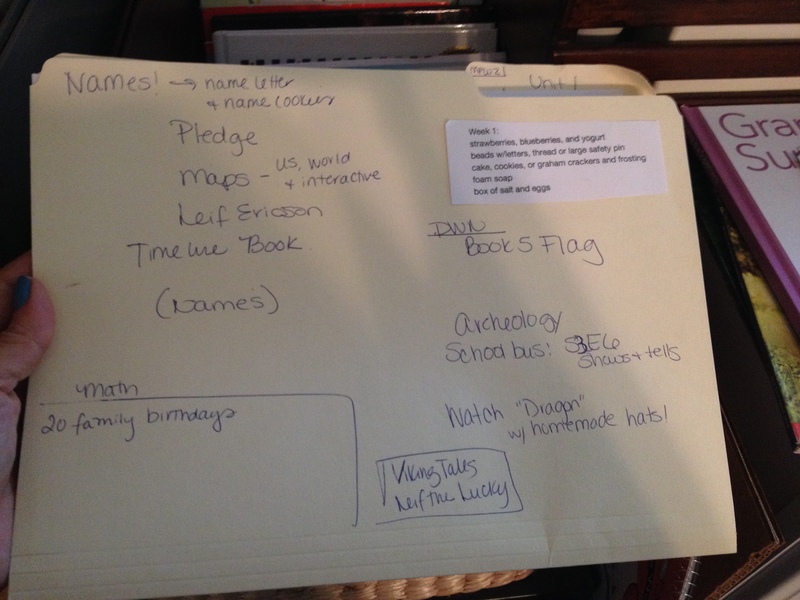 I write out all the various themes, supply lists, Draw Write Now page numbers, pinterest ideas, correlating Magic School Bus episodes, etc., on the outside. I enjoy pulling it out for the sheer pleasure of gazing upon its state of the art efficiency. Thankfully, there are lots of loose hand outs this year. 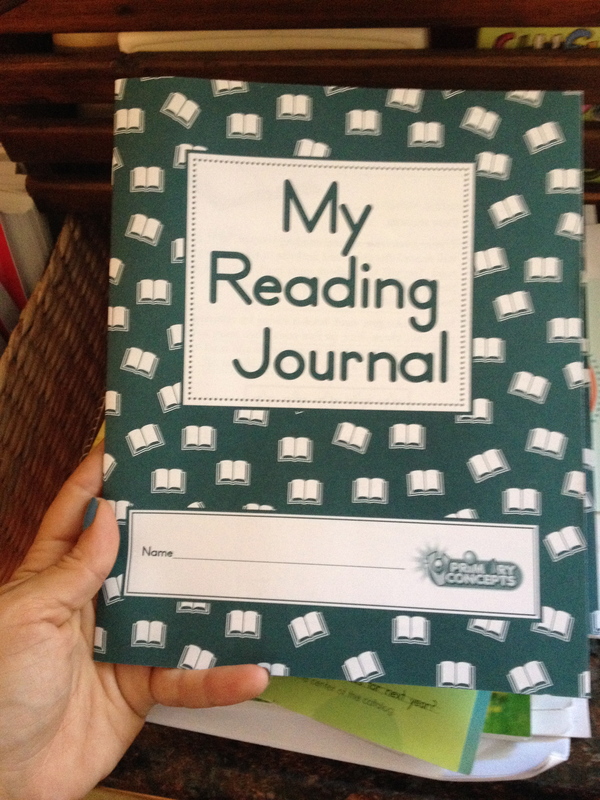 Gone are the days of 1st grade spiral-bound splendor. 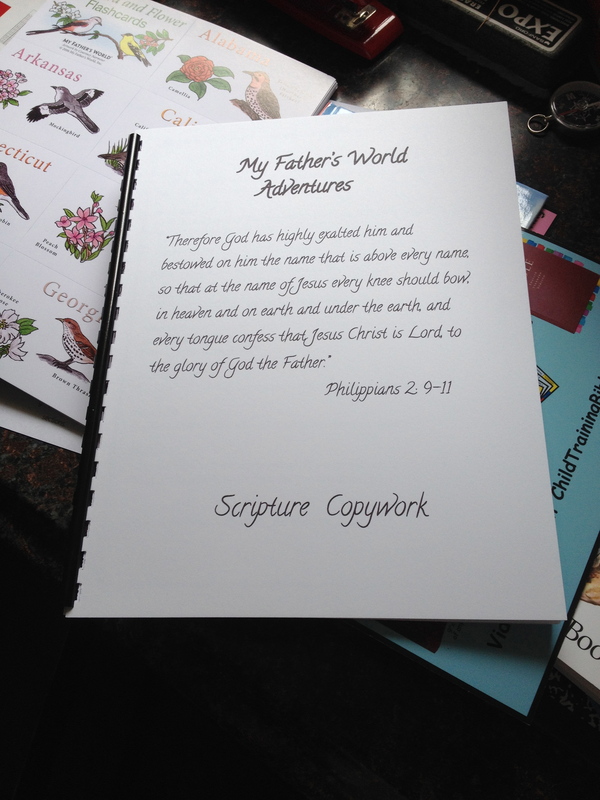 The boys each have four bound booklets. 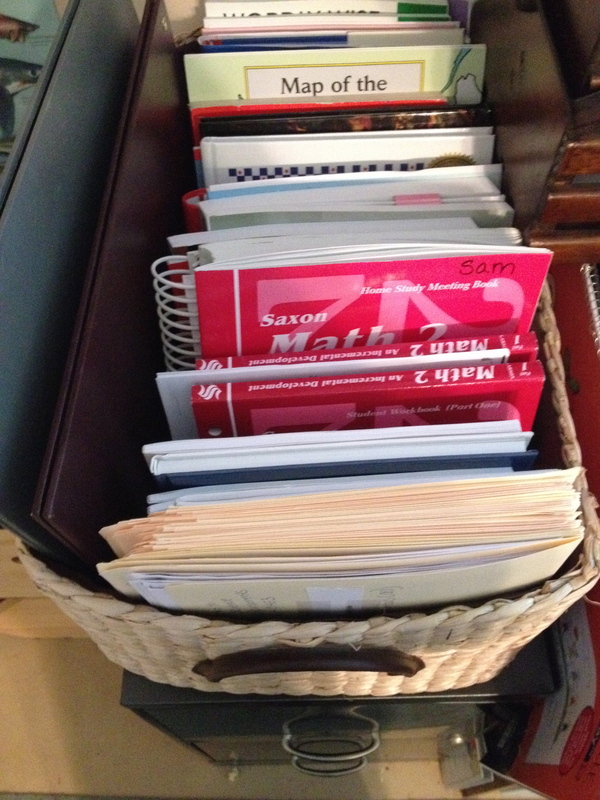 Most of my reference books I stack next to my other basket, which holds timeline cards from Classical Conversations, tin whistles, flashcards, etc. Explode the Code, Draw Write Now and any other remedial teaching aids I need to access quickly rest against that basket. If its one area I don’t skimp on, its books! I am a mathematics disaster zone so the personal library overload is a bandaid on my numerically illiterate heart. 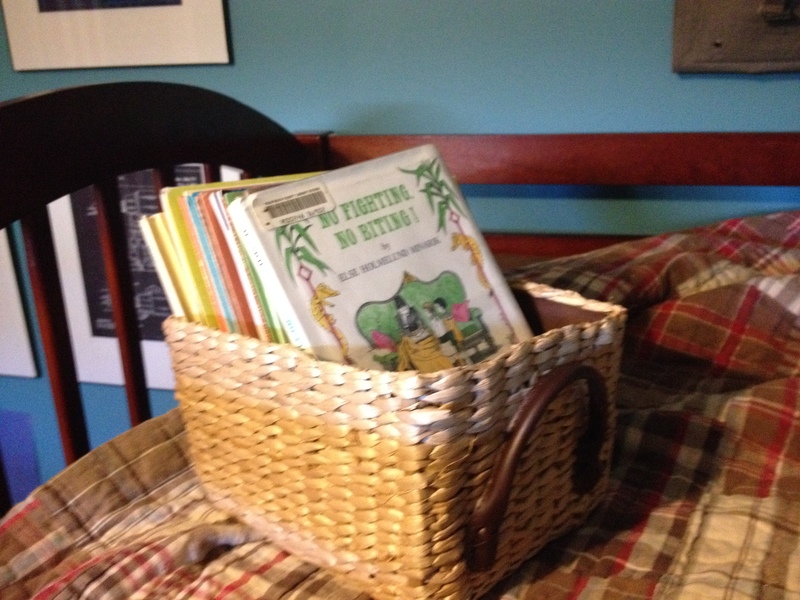 The boys have small book baskets on their bed, filled with read alouds from the library. 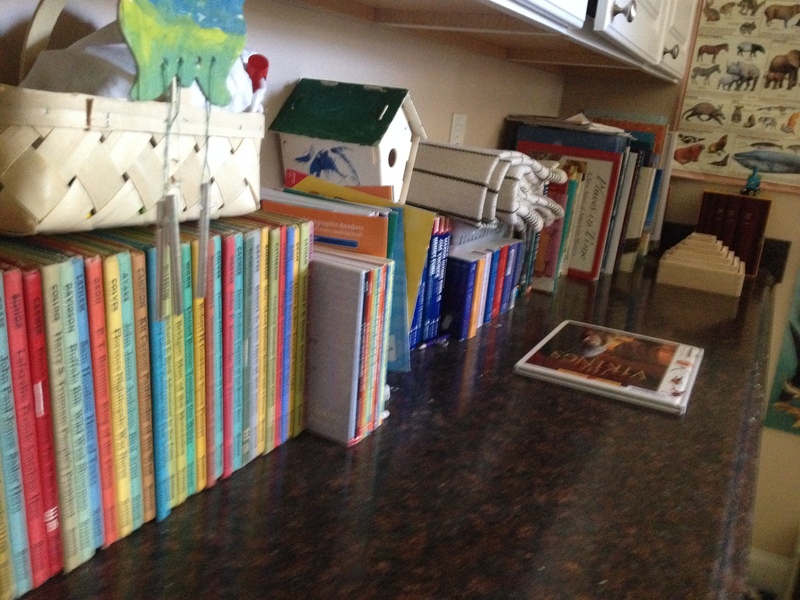 I am encouraging them to keep a simple log of their favorite books this year. Found this puppy at convention last month in the Rainbow Resource booth. I have no doubt that this particular item will either be a total hit or miserable miss. I have also surrendered my counter space in the classroom to our History books. We received many of these when a local library closed and everything else was found at thrift stores or thrift sites. I’ve added several books off of the Sonlight core reading list for American History, which I bought used. 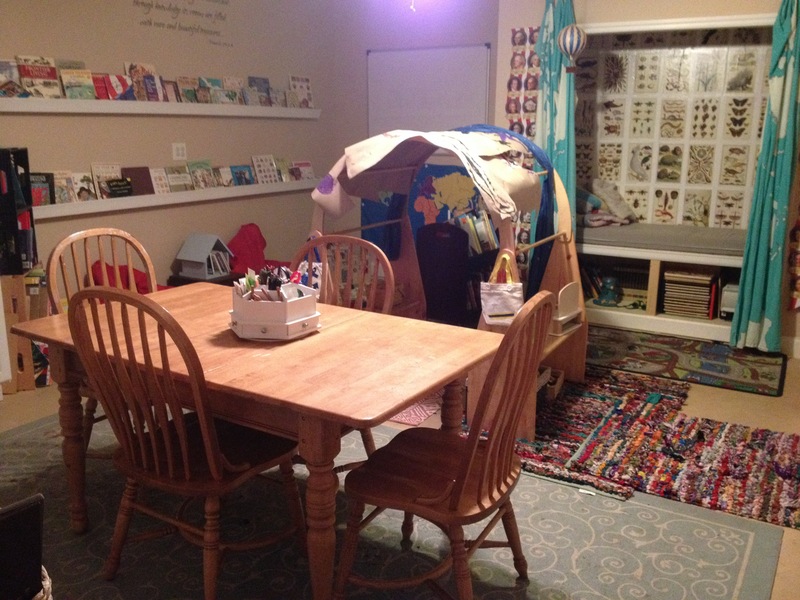 And now for a quick look at the setup in our classroom (which was once a garage, refurbished into an office space by the family that lived here before we bought the farmhouse). This is the cleanest my work space will look all year. I am more than ok with it looking a bit messy. 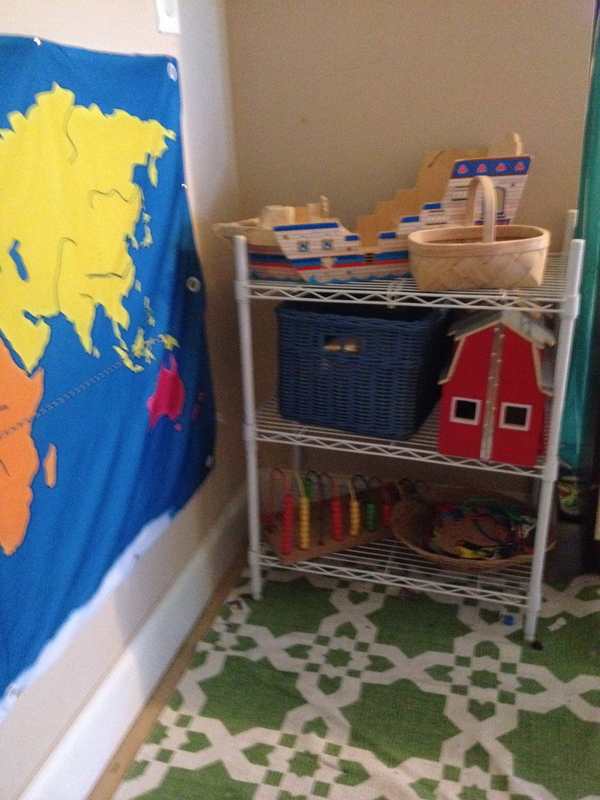 I love those Montessori preschool spaces with their airy light and open bookcases and trays of educational goodness, free from pesky bourgeois germs, boogers and crayon marks. 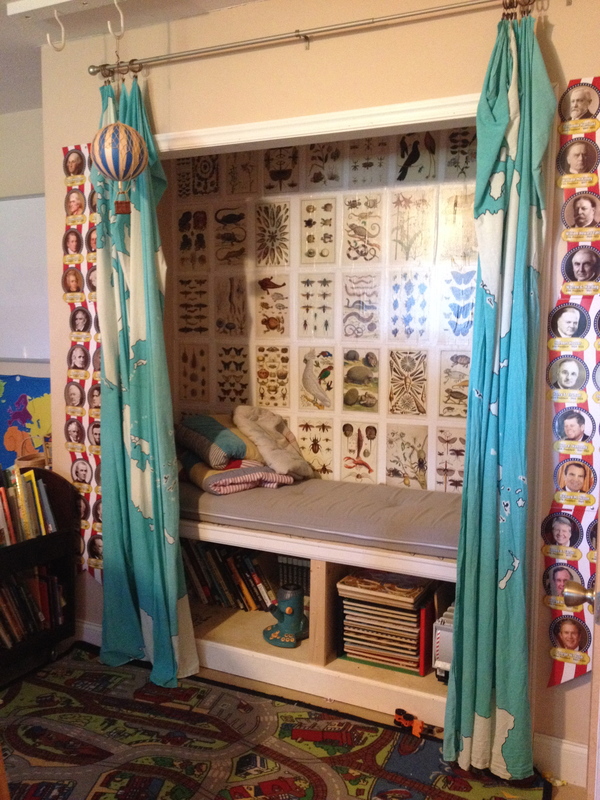 Alas, this classroom is dripping with books and papers and life, and so the lofty Montessori Play Space pins remain in the graveyard of my pinterest board. The work table. A donation from the basement of my generous in-laws’ home. I go through at least one bottle of Goo Gone on that table alone each year. The rest of the classroom is outfitted for the imaginative play needs and heavy-handed dictatorial demands of the preschoolers. Nothing matches and everything is covered in a fine layer of cracker crumbs. I love our play stand, which is rarely used as pictured in the catalogues. It is, in fact, a jungle gym for marine training, and occasionally moonlights as a covered wagon, submarine, wigwam, and/or a Starbucks. 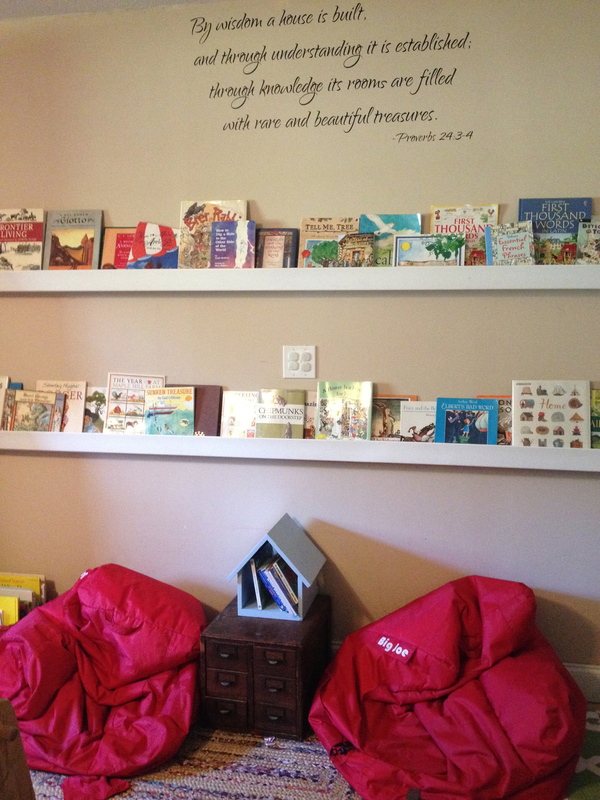 The book nook was built by my Hubs and Father-in-law. I modge-podged pages from a science book onto the back wall. The lower cubbies hold a science center to the left, puzzles and cars to the right. When the curtains unfurl they display a terribly inaccurate map of the globe courtesy of Urban Outfitters. I try to stack things in corners for the nosey ones to sort through: lacing cards, magnet tiles, a basket of peg pirate people. By the end of the school day these shelves are typically empty and some enraged tiny person is standing on its wiry top, shouting down at the rest of us. 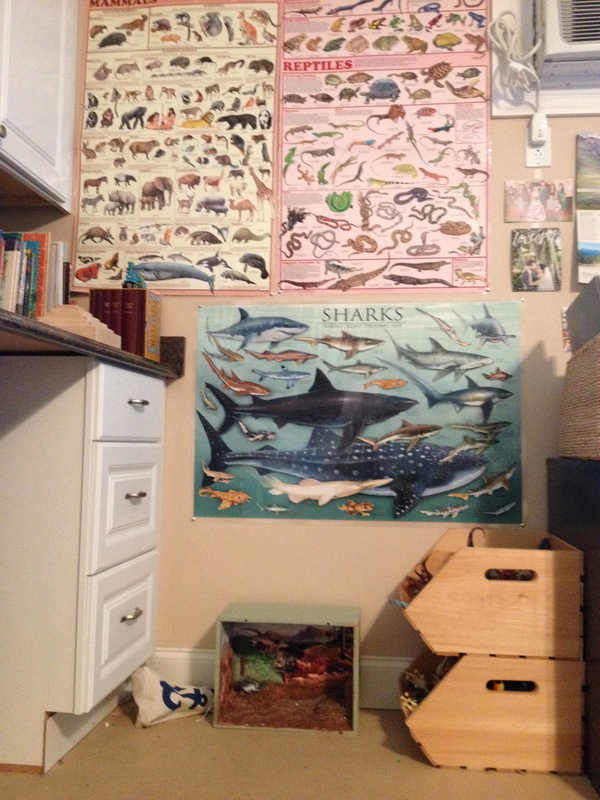 All of our Schleich toy animals live in wooden sorting crates under these science posters. They do take frequent sojourns throughout the house, but this is their main landing place. Lastly, the littles enjoy these Big Joe chairs (which lost their shapes 5 months after we purchased them). I usually leave the elders working on an assignment so I can cuddle up with Team B and a few books. And that is how we pulled stuff together this year for MFW Adventures. We are adding in our preschool curriculum this August so stay tuned for that bit of lunacy. This looks incredible! I love that fabric, map you have hanging on the wall, too! Everything looks great. I love love love your method of organization, simple yet effective. I’m starting beginning of August and doing Beautiful Feet as well and also just decided on thinking of the weeks as units instead of weeks to try to free my OCD self. I’ll be following your blog for sure! Thank you! 6 weeks in and I am glad we are looking at them as units. Can not handle the “week” deadline. Especially when the kids are begging to linger. 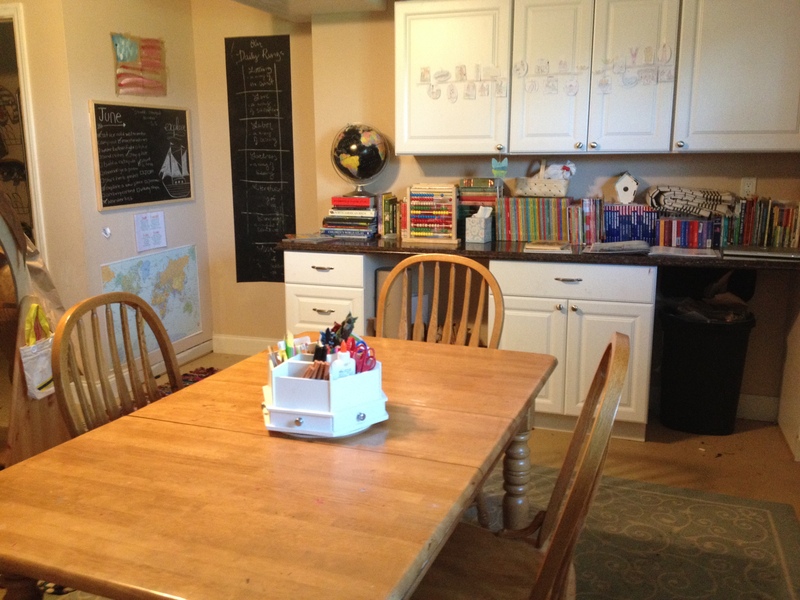 Love flexibility of homeschooling! Awesome! Thanks for sharing. I really appreciate how you admit it’s not all pinterest-y and that that’s OK! Great info thanks so much! Did you find spiralizing the papers worked well for yall? I want to do it bc who likes a bunch of hole punching ?? 🙂 But was worried if I wanted to add anything, I wouldn’t be able to like I could with a 3 ring binder. Hahaha I love your writing style! I had planned on doing nothing formal with my littles until they hit 5yo, but my husband insisted that it’s time they learn how to count and write their names, so pre-k madness…here we come! When you order from MFW did you get the whole package or just the teacher’s manual and student sheets? I am trying to decide if I will need all that comes with their packages. TIA! Depends on the year! Sometimes I wanted to do different science or something like that and I would tweak it a bit. May I pick your brain regarding MFW? My eldest enters Grade 3 this Fall and my youngest Kindergarten, and here I am still floundering somewhere between Charlotte Mason and Classical. From the beginning I have piecemealed our curriculum, often unwittingly erring on the side of too many workbooks and not enough richness. Currently we are trialing a Term of Ambleside Online Year 1 and adore some aspects, but not others (e.g., intense British History reading with barely a brush into our own country). I keep finding myself drawn to MFW for its biblical basis, family History cycle, and some semblance of structure to carry us through all the way to high school; but from a catalog page or sample PDFs, MFW can translate a bit weak in its literature selections, or too full of cut-and-paste. Your blog posts make me wonder if I have viewed MFW in an unfair light, you make MFW look like the structure with freedom I wish I could find for my children. Have you made many additions or modifications to the curriculum to arrive at this point, to make the curriculum more Charlotte Mason-friendly? Or is MFW really that happy medium between all book work and all book reading?